Past - Present - Future is a beautiful engraving sentiment. Engagement ring engraving is an ideal way to personalize an engagement ring without disrupting the continuity and beauty of the ring's design. Furthermore, engraving is a private comment shared between just the two people for whom the ring symbolizes love, fidelity, and forever. Single words with deep meanings such as "forever," "eternity," "yours," or "always"
Some couples, however, opt for more daring engravings, such as admonitions about putting the ring back on, remembering an embarrassing moment, or other inside jokes or events that are uniquely meaningful to their relationship. The best types of engagement rings to engrave are those that are wide enough to offer a clear view of the text without seeming cramped or being too small to read. 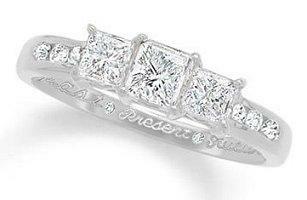 Gold and silver rings engrave exceptionally well, as do platinum engagement rings. Harder metals such as titanium and tungsten are difficult to engrave and writing may appear faint and nearly illegible. Many couples choose to engrave men's rings to give them personalization and intimacy without overt style details, though a woman's ring can be engraved just as easily. Engraving should be easily legible. Choose a font size and style that can be read and won't be too thin or tiny to decipher. Keep the sentiment short and simple to prevent long phrases that will be cramped along the ring's circumference. Choose a word, phrase, or other sentiment that will be timeless: trendy jokes or nicknames may go out of style but the engraving will be difficult, if not impossible, to remove. Unique ring engraving ideas can still be suitable if done appropriately. Double check the engraving both before and after it is applied to be sure of correct spelling, appropriate numbers, etc. Write down the type of engraving (font, sentiment, size) and store the information with the ring's certificate; it may be useful for identifying the jewelry if it is ever lost or stolen. Clean engravings carefully with a soft bristle brush to keep them visible. 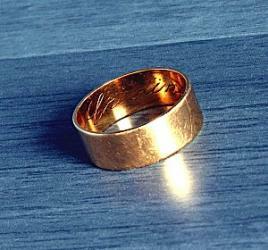 Many couples may like the appeal of personalized engraving, but may not have the budget, jeweler, or time to arrange it. Furthermore, some superstitions feel that engraving actually weakens a ring, making the bonds it represents less powerful between the couple, and some couples simply prefer personalization that can be seen and appreciated without removing the ring. There are several engraving alternatives that offer a personalized look, including choosing a filigree ring that incorporates a hidden symbol or message into the ring itself, or opting for a figural or Celtic design that has inherent symbolism. Choosing a birthstone ring is another way to incorporate personalization without engraving, and some couples may even design their own rings for the ultimate in personal expression. Simple engagement ring engraving is relatively inexpensive, depending on the type of metal to be engraved and the extent of the message. Elaborate fonts, longer sayings, and stronger metals typically increase engraving fees, as do rush orders or any unique symbols (hearts, etc.) that are not part of a standard typeface. Engraving can cause several problems with the engagement ring. Engraved rings are usually non-returnable because of their personalization, and intricate engravings may make the ring unable to be resized or repaired in the future if necessary. For many couples, however, those problems are minimal when compared to the special intimacy of a hidden message on this most romantic piece of jewelry. Engagement ring engraving is an easy way to add personalization and symbolism to an engagement ring without creating a customized ring. An affordable way to personalize a ring, engraving can be sweet, romantic, funny, or sentimental, and it helps carry those emotions throughout the relationship and into happily ever after.